A contractor crew lifted steel bulkheads on the upstream side of the St. Anthony Falls Lock on March 20, a tricky maneuver completed in advance of anticipated high flows resulting from snowpack melt in the Mississippi headwaters. 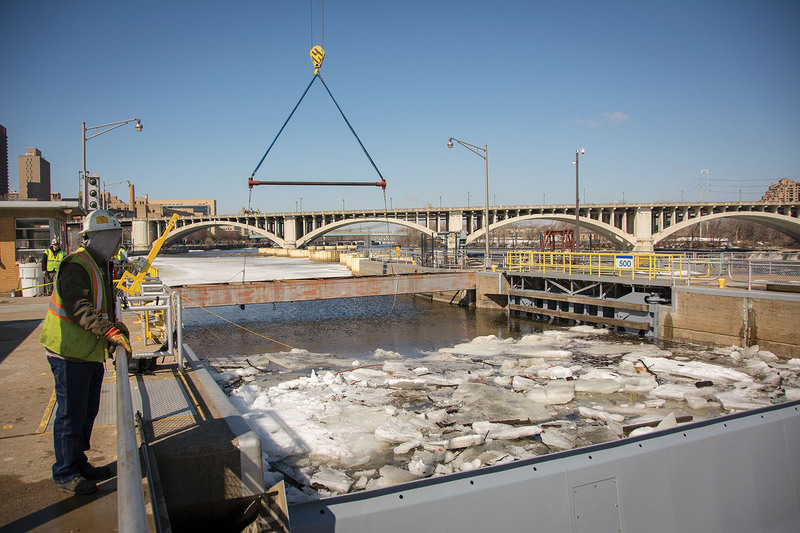 For nearly two weeks, lock staff and personnel from the maintenance and repair section broke up mounds of ice that had accumulated below the bulkheads to ensure the miter gates and tainter gate were operational and the bulkheads wouldn’t stick during their removal by means of a crane. With the bulkheads removed, the site can now be used to mitigate potential flood impacts by releasing water through the lock chamber (of the 13 locks and dams in the St. Paul District, only Upper and Lower St. Anthony Falls were constructed to mitigate for flood impacts). Removal of the bulkheads also signifies the near-completion of a major rehab project that includes installation of new machinery to raise and lower the tainter gate and the application of a protective coating on the tainter and miter gates, highlighting an effort to ensure operability of our critical infrastructure for future generations. The move was the last step in a $3 million upgrade. Although the St. Anthony Falls Lock was closed to commercial traffic in 2015 out of concern about migrating Asian carp, it is still authorized to operate for flood control.